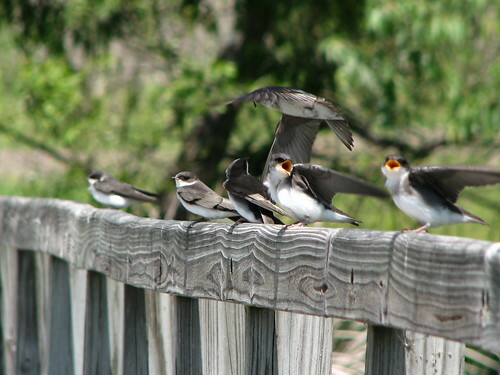 I believe there were six hungry young swallows lined up on the rail, but it seemed like a lot more given the activity before me. As I watched a pair of adult Tree Swallows feed their charges, I couldn’t help but notice how big their babies were. These fully fledged young were as large – if not slightly larger- than the parents themselves (see below). In this case the term “baby” doesn’t mean “little one.” Only the tawny brown upper plumage and begging behavior served to differentiate the young from the old in this case. (Adult Tree Swallows have iridescent green-blue upper plumage). Over the course of about a ½ hour, the parent birds never ceased activity. 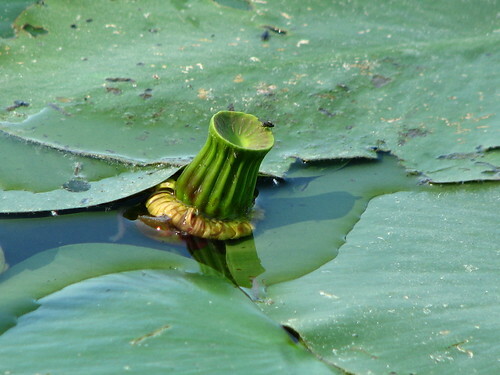 They would glide down low over the marsh waters, stoop to pick insects off the lily pads or in mid-air, then loop back and shove the newly found morsel into one of the awaiting open mouths. The actual transfer was executed in mid-air and the adults never landed. The acrobatics required to maintain air stability while feeding was made even more dramatic by a very stiff western breeze. The young were lined up with their faces to the wind as if in an air tunnel. An occasional burst would knock one of the young birds off balance and send it kiting vertically into the air – at which point it would gain balance and glide gently back into its proper place on the rail. The adults always approached opposite the wind direction, so the young were required to momentarily break their aerodynamic stance in order to receive their gift. In all case, the food was literally shoved in the open maw with little ceremony. 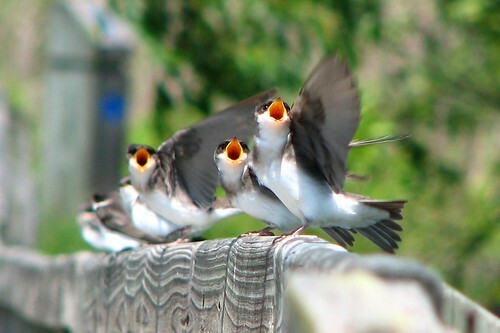 As each parent neared the chorus line, the young would begin to flutter their wings (see here) and open up their mouths (see above). The bird closest to the arriving parent would strain the hardest and the degree of display intensity diminished further down the line (see beginning photo & here). Somehow, the adults managed to distribute the wealth evenly. This was not a good day to be a bug. It took barely 30 seconds for a walking/flying insect to go from freedom to foodom as the adults continually looped about and back again. Although I couldn’t tell what kinds of insects were being transferred, they were all fairly large. One even left a nice little string of bug juice from young to parent (see below) as it was being passed. 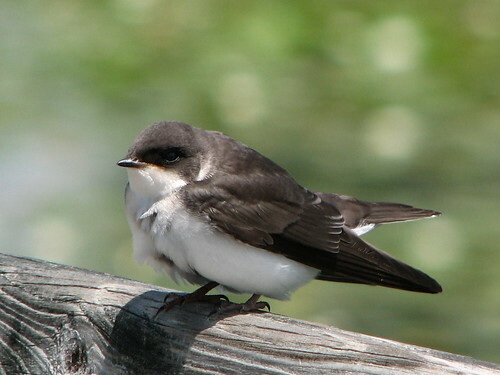 According to the literature, Tree Swallows seem to prefer members of the fly family (Diptera) and they deliberately select for fly food that is over 3 mm in length. When free-styling they will snap at much smaller critters, but when kids are involved they go for the bigger food. Although only the female incubates the eggs, both parents are involved in feeding. The female holds the upper reproductive hand, however. Scientists call it “extra-pair” mating, but you might call it “fooling around.” The females will often mate with other males, in addition to her chosen partner, and her resulting young will have varied parentage. 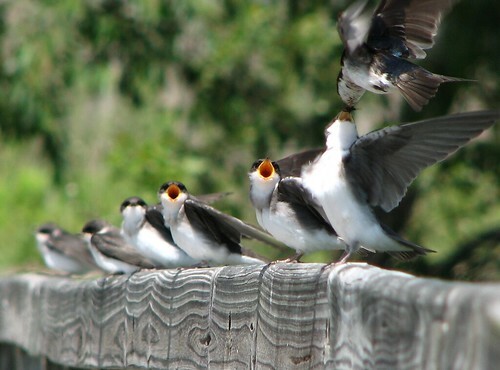 Tree Swallows have one of the highest rates of philandering in the bird world! The end result of all this messing around appears to produce stronger broods. Fortunately there are no mailmen among Tree Swallows because within any given brood several of the babies would look like him. Looking down the line of these six hungry chicks, they all looked pretty much alike – especially with their mouths open. So, there’s no telling whose baby belongs to whom. Regardless of what the blood tests say, all of these “little ones” were days away from independence. Tree Swallows are cavity nesters (there is a dentist joke in there somewhere) and the young fledge at about 18-22 days. Once they leave the nest hole, most swallowets seek their independence soon after exiting. There are cases, however, where adults will continue to feed their young for several days after nest departure. 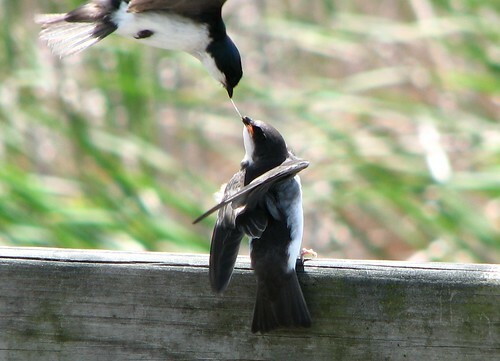 This situation was apparently such a case and if I wore a hat, mine would be off for these selfless parent birds. I guess you could call them the ultimate helicopter parents. Every year I promise myself that I will not devote another installment of Naturespeak to deer and every year I break that promise over and over. I do not dislike deer (that much!) but feel that I’ve probably covered every angle of their existence. Well, true to form, I recently encountered yet another opportunity to break my “no more deer policy.” A frisky pair of White-tailed Deer fawns entered the Marshlands Museum yard the other day and began to romp around like puppies. I could not resist the chance to photograph these little fellows. I mean, come on – these are fawns we are talking about! Everybody loves Fawns (even coyotes). A rainstorm was moving into the area under the accompaniment of bouts of rolling thunder. A doe and her two newish fawns ambled into the yard and lingered as the rain began to fall. Mom deer paused to browse on some dogwood, but her fawns were not about to pause for anything. Full of “piss and vinegar,” they started to run around in circles and engage in some serious deer play. The combination of rain and rumbling weather prompted them into this activity. They ran about for around 5 minutes before finally running out of steam. The speckled fawn pair, here pictured (see rapid-fire picture above and movie here) were probably about a month old. Though capable of nibbling on a few greens they still have another three months to go before they are truly weaned. So, while mom eats they run. These fellows ran about the open grass until reaching a point of exhaustion. You’ll see in the video that they were sucking air through open mouths and panting quite heavily by the time they were done. I only filmed their last dash (it took me three minutes to decide that I should break my “no deer rule” and get out the camera). It is worth noting a few things, as long as we are on the subject. First of all, I’ve noticed over the years that rainstorms seem to electrify fawns. I have seen fawns dashing abut wildly just previous to, and during, a rainstorm. Secondly, fawns are basically scentless when first born. During their first week of life they spend a lot of time lying flat and helpless. Scent would literally be a dead give away to predators seeking tender venison (or venifawn, as it is called) at this time. Mom will even eat the fawn poop in order the keep the no scent zone active at both ends of her babies. 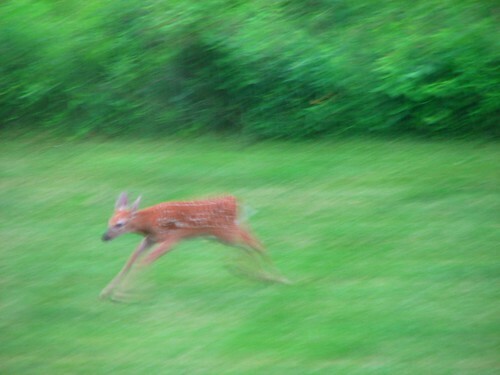 It is safe to assume, however, that running fawns are no longer scentless since they now can escape. It is also assumed that mom no longer needs to eat their poop for the same reason. In other words, by the time the fawns get the runs the doe is relieved of her crappy task. In grizzly bear country, they say it is standard practice to sew tiny jingle bells onto your hiking clothes and to carry a can of pepper spray at all times when on the trail. The constant jingling wards off bears and the spray acts as an effective last minute deterrent in the event you are charged by one of these irritable beasts. They also say that it is easy to identify grizzly droppings because they are packed with jingle bells and smell like pepper spray! 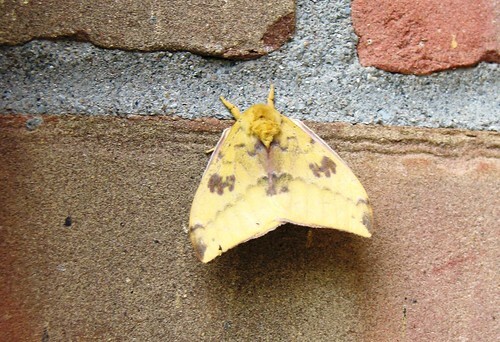 I was reminded of this when I recently spotted a beautiful Io (pronounced I-Oh) moth clinging to the wall under one of our museum porch lights. I will explain, so bear with me. These solid little members of the giant silk moth family (named after a mythical Greek maiden) are known for flashing a pair of startling eyespots when attacked – as a deterrent. Theirs is a classic textbook case of predator evasion. This reflexive action, which involves a spasmodic lifting of the upper wings in order to flash hidden “eyes” on the hind wings, is intended as a visual “pepper-spray in the eye” toward the attacker. To be effective, this action needs to be followed by an immediate escape. Because of the fact that I frequently find detached Io wings scattered under this very light tells me that this defense is less than perfect. The presence of pepper-spray wings, pulled off by hungry birds, is akin to finding a pile of human-enriched bear dung. I was, in fact, quite surprised to find a whole Io moth under the light for a change, so I took the opportunity to photograph it. This individual was a male with bright yellow upper wings. The females have more matronly proportions and have reddish brown upper wings. 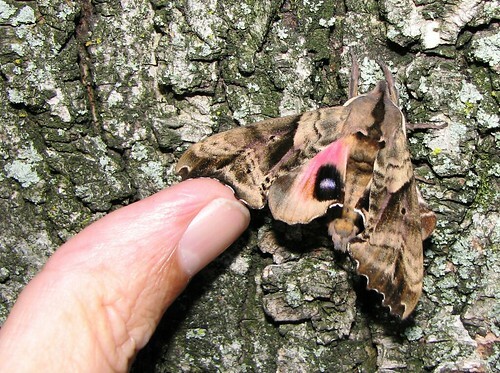 Both sexes possess the startling eyespots on their hind wings. 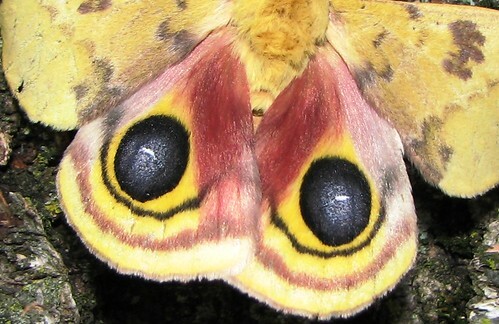 It took a little prompting, but I managed to persuade the moth into flashing those famous eyespots (see below). His enthusiasm was less than impressive and he failed to drop off after doing it, but the act was photographically adequate. 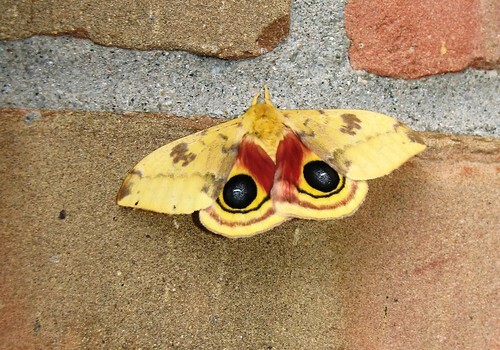 Oddly enough, another “eye-spot” moth was perched on the morning wall beneath the Io. It was a nice example of a Blind-eye Sphinx. These medium sized moths rest with their wings folded back like withered leaves in order to blend into the background. Their black-bordered blue eye spots are subtle but potentially effective. I was unable to persuade this fellow to flash even when I called him a “do-nothing butterfly” and “a glorified house fly.” Nothing worked except my finger physically pushing the upper wing away to reveal the secret eyes beneath. Perhaps these two moths were in a stupor – their brains fried by the electromagnetic waves of the porch light. They would soon both be bird bait there on the wall, so I carefully plucked them off and took them home for some more photo work. Positioned on the bark of one of my backyard maples, the Io and sphinx looked a bit more natural but were still unresponsive. The Sphinx blended in so well that it was near impossible to see (see here) while the lemon-colored Io stood out like a Greek goddess at a weight-watchers meeting. I left them both to safely enter the night and fly away. By the next morning, they were both gone. I assume the superbly camouflaged sphinx made good his return to the night air without needing to “flash wing” at a predator. His Greecian friend, however, did not fare as well. A single battered hind wing lay on the ground as mute testimony of a fatal run-in with a hungry bird (see below). Apparently jingle bells and pepper spray can only go so far. 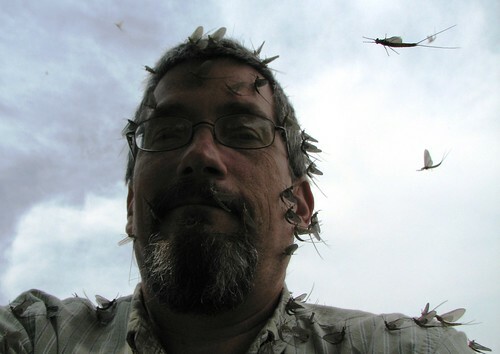 Call ‘em Canadian soldiers call ‘em June flies, call ‘em Fishflies – call them what you will, but the Erie shore is currently under attack by hordes of Burrowing Mayflies. The first of several waves has already hit the beaches from the Detroit River mouth and all parts south along the shore to the Ohio line. It happens every year about this time as long warm sunny days melt into humid sultry nights. This daylight/temperature combination stirs the aquatic nymphs of this species into action and incites a mass emergence that can only be categorized as an invasion. Unlike similar invasions of leaf crunching gypsy moths and Japanese beetles, however, this native uprising is a good thing. I traveled through the Detroit and Woodland Beach neighborhoods – located in northeastern Monroe County – in order to get a feel for this event. I’d classify this one as “a doozy.” There are few people who actually relish this annual spectacle, but I do. The reason can be stated plainly. Burrowing mayflies spend nearly their entire life in the shallow water environment of the lake and river. They cannot survive in polluted water and so are considered an indicator species for healthy aquatic environments. In other words: the bigger the hatch, the better the immediate aquatic environment. It’s that simple. For a river and a lake that has experienced a dismal past, this is a significant thing. Unfortunately, for the human residents of these lakeside communities their view of this event is not that simple. 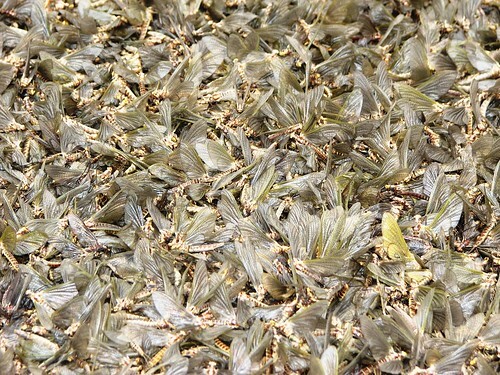 Every house, every tree, every porch light becomes coated with millions of wiggling mayflies. 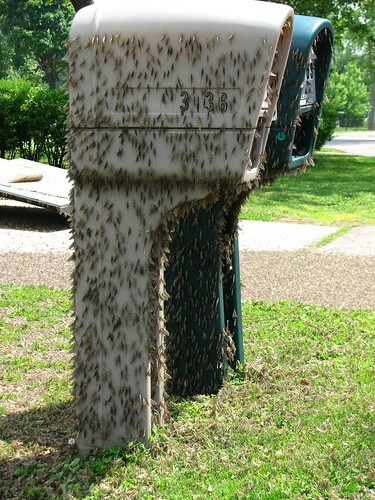 Piles of dead insect bodies accumulate under every streetlight (see below). Passing cars produce a distinctive Rice Krispie sound (snap, crackle, pop!) as their tires flatten trillions of the ill-fated mayflies. Here the speed limit is very low, so the effect is enhanced to the point where you can hear the explosion of every single tiny body. The sound, something akin to popping bubble wrap, was music to my ears but I can certainly see how it could be considered un-nerving to some. The expression on the face of the young lady I observed spray washing the critters off her car was not one of contented resignation. She was blasting away with a frowning vengeance. A trim white-haired lady crossing the road to get her mail danced her way to and from the box. She was not dancing with joy, but was systematically plucking “flies” off one by one. Her face was contorted in a way that showed off her well-earned wrinkles. Another pre-teen girl, her smooth face equally contorted, bounced down the road one leg at a time as each appendage was cleared of the unwanted passengers. I wanted to stop and tell each one of those people the “good news” of the risen flies, but held back. I was the outsider in this affair. I tried to bring up the subject with one fellow but he only returned a disturbing glance and said “you can have them all.” You could tell that he meant what he said. Burrowing Mayflies, or “Hexs” for short, emerge as winged adults in the evening hours and seek resting spots to pass the daytime hours. In this initial stage they are dark colored sub-imagos. Sometime during the following day they shed their skins one more time and convert to larger yellow imagos. As imagos, they are prime for the big night-time mating flights on the next night. Some will complete the cycle of life and die a happy death, while many others will meet their end beneath rubber Firestone circles. Regardless of the manner, all adult burrowing mayflies die within 48 hours. Because of this, their invasion waves are intense but short lived. There was one thing left for me to do before leaving this particular intense invasion site. Upon spotting a small tree which was literally quivering under a mass of mayflies (see video here), I confidently strode up and allowed the mass to transfer to my body. For a moment, every part of my person was covered and I was happy. Ladies and Gentlemen, this is the face of a man who knows the secret of the mayflies. 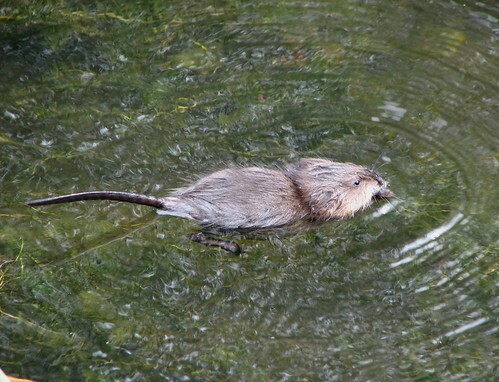 Never mind, for the moment, that 85% of muskrats born in any given year do not make it to their first birthday. In fact, nearly all of them will be dead by the end of their second year due to the effects of predation, disease, and a whole host of natural and un-natural grim reapers. It is clearly written on the tablet of life that Muskrats are born to die young (paragraph 3, line 2b). All this might seem a bit depressing from a human perspective, but muskrats are not human and do not dwell on such negative thoughts. They eat like there is no tomorrow and reproduce like rabbits to insure that there is a tomorrow. A pair of muskrats, occupying a bank den adjacent to a local Lake Erie marsh, recently displayed their newest crop of little ones. There were three in evidence this past week and they were already on the verge of independence. 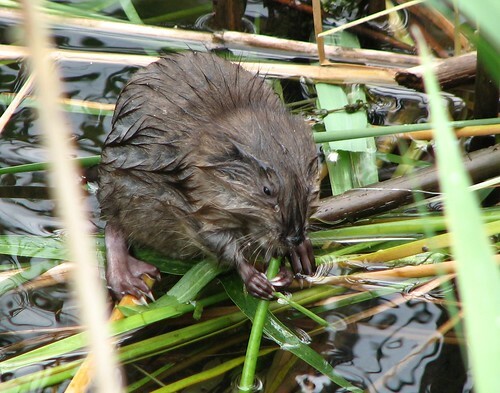 Baby muskrats enter the world via the fast lane. They are able to take in green food by their 21st day of life and are completely weaned within one month. I would imagine these micro muskrats were newly weaned individuals. Their mom (see below, totting a fresh alder cutting) was probably already well into her third pregnancy of the season – she definitely had that “gleam” in her eye. Her thoughts were already on the next generation. About the size of a softball, these newly independent ratlets were in full possession of their adult traits – long tail, soft water-repellant hair, and luxuriant pink toe nails – although proportionally they had quite a bit of re-adjusting to do. The rest of the body needs to catch up with the head and over-sized back feet, for instance (see below). It is doubtful that they will ever catch up with their appetites. Every time I came upon them they were eating and spent the whole time, while under observation, eating. The food du Jour was equally divided between fresh cat-tail/reed cuttings and water plants. 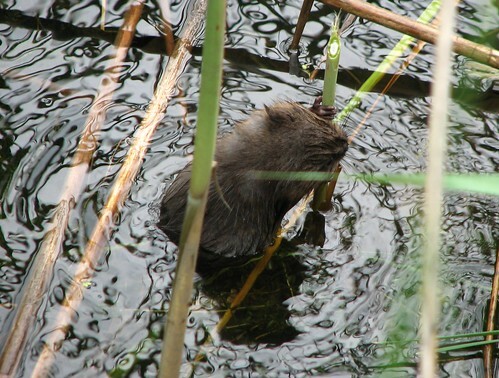 The cat-tails and reeds were deftly cut down in beaver fashion (see below and here). Each stalk was then sectioned and neatly peeled before eating. Submerged water plants were simply shoveled into mouth as the creatures swam about the surface. Take a look at this video and you’ll get a pretty good ida of what I\’m talking about. You may even get hungry watching it. There is no doubt about it; these little fellows were certainly fun to watch. They were cute, fuzzy and active – thus fulfilling all the necessary requirements for adorableness (paragraph 83, line 6 in the book of life). 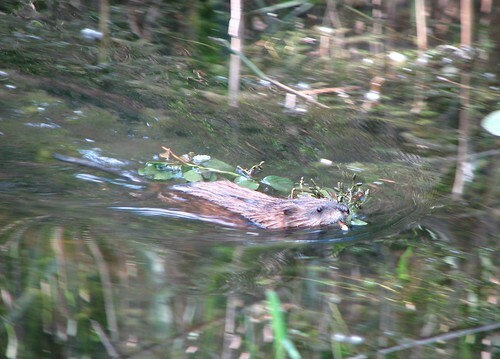 The habit of raising the tail out of the water while eating is especially endearing, although adult muskrats do this as well (see below and here). 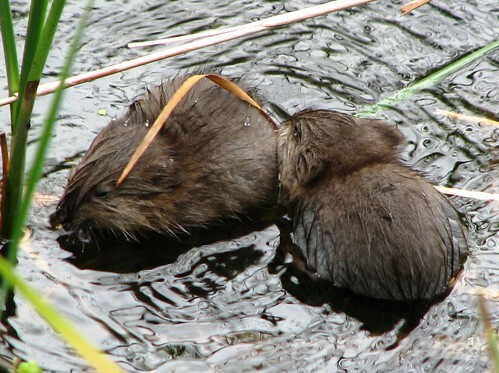 Admittedly, the only disturbing part about watching baby muskrats is that they are so easy to approach. Their ignorance borders on stupidity. There were only two times, over the course of three days, that I aroused their suspicions. Even a few throat clearings on my part didn’t do the trick. You’ll see in the video that a slight movement of the camera angle did cause one of the ‘rats to suddenly plunge into the water – leaving his partner wondering what the commotion was all about. The escapee, however, was back up in a minute and soon filling his face as if nothing happened. Had I been a hawk or a mink seeking easy prey, these observation sessions would have been much shorter. Oh well, let’s hope these baby muskrats are able to enjoy the world stage at least until the third act. Yes, my initial reaction upon seeing the captured spider placed before me was less than professional, I will admit. But, the dark furry creature that spanned the bottom of the pretzel jar was shocking – about three inches in circumference around the legs. The body was fully 1 inch long. Its movements were measured and slow and its colors muted and mouse-like, so it was not especially threatening. But, the hollow dry remains of the Ctenuchia moth next to it were mute evidence that this thing was a predator – a relatively huge predator at that. My reptilian brain was screaming while my simian brain bade me to look closer. “I kept seeing this thing on my engine block, “said Terry, the fellow who brought it in, “but I couldn’t catch it. One day I came out and there-it-was (he has a way of speed joining his words) on the driveway in front of the truck sooooooo, I-grabbed-it.” There was nothing about his demeanor that was creeped out or edgy. It was as if he’d captured a shrew or something. Unfortunately, I initially mis-identified the thing as I checked to make sure the lid was on really tight. I called it a wolf spider and declared it harmless as I discovered that the lid was barely on and quickly remedied the situation. Terry was satisfied and left the creature in my charge. I was immediately ashamed of my reaction. Here was a guy who repeatedly encountered this huge spider and sought to catch it. He was fascinated by it. I, the trained naturalist, was horrified. He calmly captured it and took time to feed it, while I would have attempted to run it over. At the very least I would have accelerated the car and then slammed on the brakes in order to send the creature flying into the dicing blades of the fan. I am not proud of this. I did do a bit of investigating and found out that Terry’s beast was not a wolf spider but was a Fishing Spider. 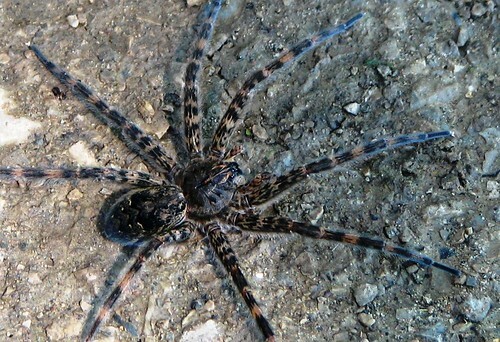 These creatures are among the largest spiders found in the Midwest. They are our tarantulas. Like those south-western giants they are relatively harmless. Sure they can inflict a bite, but they choose not to (and their venom is not of the deadly sort – to humans that is). Fishing Spiders, true to their name, do habitually hang out around water and can even walk on it, but they also spend a good amount of time in dry land habitats. As near as I could tell, this particular species was called Dolomedes tenebrosus -the ornamentation on the abdomen and cephalothroax point to this identification (see above and detail here). Wide spreading hairy legs allow this spider to distribute weight on the water and the fine fuzzy coat traps in air in the event of a temporary dive. Those eight lanky legs also provide excellent tools for engaging in short fast bursts on land to grab prey. 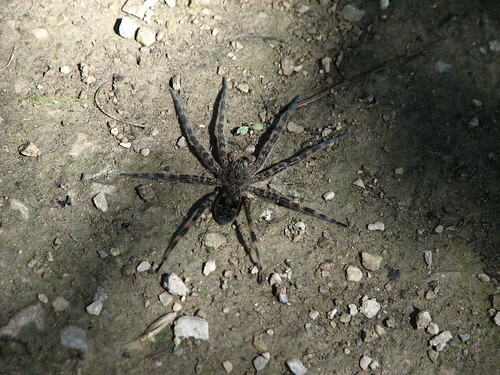 Unlike the wolf spiders, who chase down their prey, fishing spiders wait in ambush (for instance, when people lift up their truck hoods) and then launch an attack. I released Terry’s spider and took the opportunity to take a few pictures of it before it ambled off. I was, in fact, almost sad to see it disappear into the undergrowth. It moved more like a mammal rather than a jittery spider and those beady eyes – all eight of them – seemed to exude some deep intelligence. The thought of this encounter was still clear on my mind later in the day as I returned home, but it didn’t leave an un-easy feeling. As I went to turn the house lights off for the night, however, it did creep back into my thought pattern. 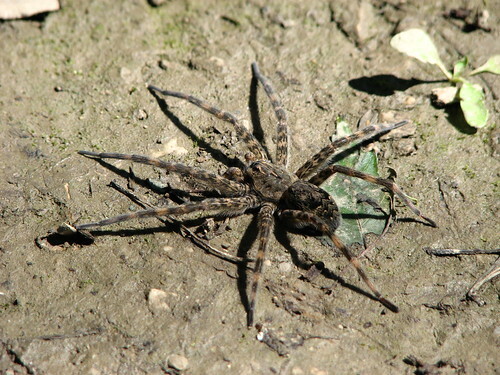 Dolomedes, like most spiders, are nocturnal. With each extinguished bulb the house grew darker and the spider grew larger in my mind until I imagined him sitting smack dab in the middle of my kitchen floor like some kind of bear rug! You can imagine my shock when that imaginary spider turned out to be a real one. Unbelievably, although this individual was not Terry’s spider, it was another Fishing Spider and it was in my house (on the edge of slipping into the darkness behind the refrigerator). Oddly enough, I did not wimper or cower. I only made an appeal to the Virgin Mary and slapped a container over the hefty beast and walked it out the front door with the intention of placing it in the middle of the road so that a car would run it over. I changed my mind upon reaching the edge of the yard and simply dumped it onto the wet grass. I am getting better at these things. If it returns I will chop it up into a million pieces, but I am confident that won’t happen). Good night to you all. The bird that strolled out onto the shoulder of the North Country road looked a bit disheveled, but his appearance was to be expected. A heavy morning rain had passed through the area only an hour previous. Everything was still wet- very wet. How wet was it? Well, it was so wet that a sizable aquatic leach was still riding the back of a Painted turtle that was out seeking an egg-laying spot up the road a spell (see here). Normally this strangely ornate passenger would be forced to seek a moister location about the inner shell edge, but not so on this moist morning. A layer of dripping wet bracken ferns baptized the pigeon-sized Ruffed Grouse as it strode openly onto the gravel. Water beaded off his back and tail but a few of the back feathers were totally soaked. I would guess his original mission was two-fold. The roadside offered an opportunity to gather a few stones to aide in digestion and then the road itself had to be crossed. My presence there was unexpected, so the creature suddenly found itself with a third option – that of fleeing back from whence it came. Fortunately, in those few moments of indecision the bird anxiously stood with every feather on end and presented a brief photo opportunity (see above and here). Since living in S.E. 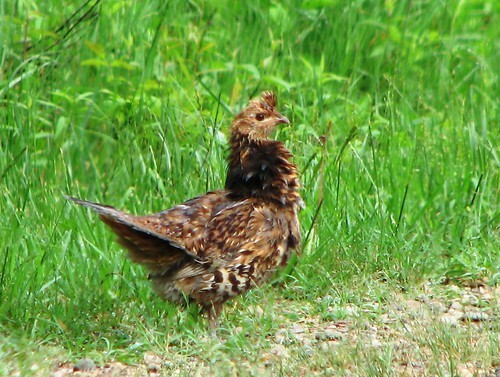 Michigan, I have been long away from the sphere of the Ruffed Grouse. I grew up in the grouse country of West Michigan and fondly remember the thumping territorial calls of this woodland bird echoing across the Egypt Creek Valley. I’ve encountered it since on rare occasions over the years, but frankly it hadn’t crossed my mind too much. A few weeks ago I was giving a bird presentation to an elementary class at my museum. 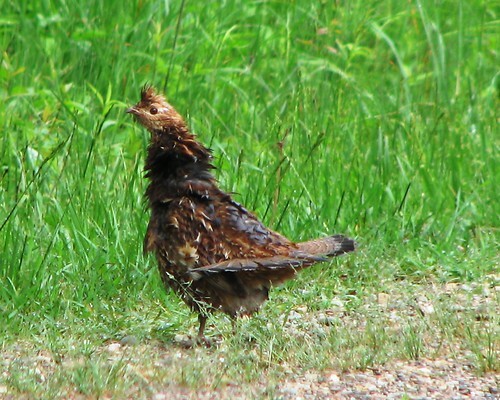 Somehow, the subject of the Ruffed Grouse came up via the random selection process called the “2nd grade stream of consciousness.” An earnest little fellow decided to volunteer, without raising his hand I might add, that he knew what a ruffed grouse sounded like. Normally I don’t accept such spontaneous outbursts, but out of curiosity I prompted him to share his knowledge. Quietly he answered: “They sound like a heartbeat.” The simplicity and accuracy of his response bowled me over and temporarily flooded my mind with memories. What a perfect description. The territorial call of the male grouse is unlike any other Michigan fowl. It is produced by a rhythmic pumping of the wings. “Thump…thump…thump,” the beat begins and it slowly accelerates into “thumpa thumpa thumpa” and then graduates into a whir of “thumpathumpathumpabrrrrrrrrrrrrrrrrrr” before coming to a halting stop. The whole routine is executed from the height of a favorite stump or horizontal log within the male’s territory. To our human perception the sound is felt as much as it is heard. You could say that it sounds like an old motor trying to kick in, or the beating of a soft skinned drum, but there is really only one way to describe it. It sounds, and feels like, a heartbeat. It wasn’t exactly a miracle that led me to the presence of a real Ruffed Grouse only a few days after my child-poet encounter, but it was an appropriate coincidence. I’d like to say that this road-crossing bird was one of those males. It definitely displayed the typical fringe of chocolate brown ruffles around his neck, but this feature is also found to a lesser degree on females. 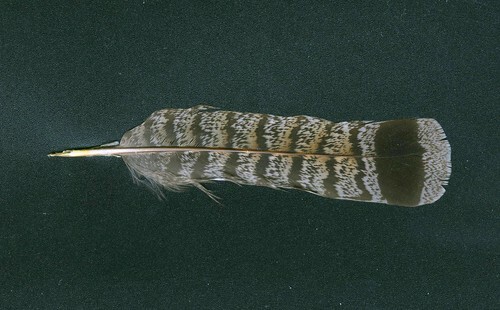 A majority of males, however, have an unbroken dark band running along the outer border of the tail feathers, while most females display a sporadic band. Apparently speckled rears are also a masculine feature. This bird was prominently banded and speckled as you can see in this view (below and here). Our roadside moment ended quickly as an oncoming pickup roared down the way. The grouse launched itself into the air and silently drifted across the road to disappear into the wet brackens on the other side. It was gone in a heartbeat. If nothing else, the incident provided an opportunity to combine a leech, a bird, a memory, and a 2nd grader into one essay without ruffling too many feathers! Although the brightly colored Spatterdock flowers captured a majority of the eye-time from the end of my Dollar lake dock, the dragonflies claimed a close second. As the day grew warmer and brighter these masters of the air grew warmer and brighter as well. 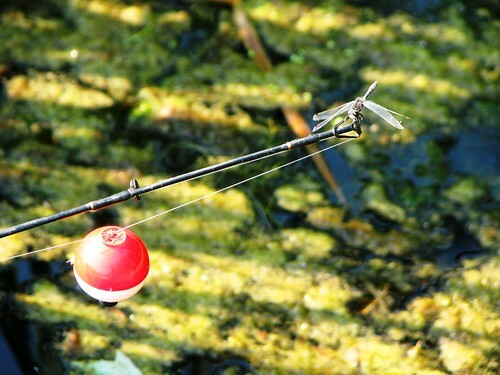 By late afternoon they were in full gear – hunting, perching, and making little dragonflies with equal gusto. With at least a half a dozen species darting back and forth there was nary a dull moment at dock’s end. Dragonflies, and their smaller cousins the damselflies, are sun-worshippers. Sunny windless days offer the best type of weather for observing them and fortunately three out of my four days at the lake fit this description. I can’t claim to identify all of the species hanging around my dockside, however. Apart from the passing patrol of an occasional Green Darner, the inquisitive hand-perching of a shy female damselfly (see here), and the ceaseless activity of one unidentified and hyperactive green-eyed species, only two of them captured particular attention. The first, called a Chalk-faced Corporal (see above), chose the end of the dock as a base for patrolling the lily pad field. This handsome male was engaged in that most typical of dragonfly behaviors called flying sorties. Using a single location as a base, this dragonfly would fly out over the “killing field” to sweep up, or investigate, passing prey and then return to the starting location. Like a jet fighter flying sorties, he patrolled a short loop and returned to base. A few moments of sun basking recharged the fighter fuel necessary to commit to another flight. He did this over and over until the place was rendered preyless, at least in his view, and he then moved on down the shore. Keeping up with the military theme here, the Chalk-faced Corporal is so-named for the duel blue corporal stripes evident on his thorax just behind the head. The light colored pug face accounts for the “Chalk-faced” part of the name, although it sounds more like one of those uncomplimentary bunkhouse nicknames. The most common members of the dock-end dragon clan were the equally pale-fronted Dot-tailed Whitefaces. These small dark dragonflies lacked the impressive size and rank markings of the Corporals, but out-numbered them by a factor of ten. The bright white facial markings, dark bodies, and the single light-colored dot on the 7th abdominal segment are the distinctive identifying marks for this species (see here). The females are lighter colored than the males, but the literature is clear on the point that the “older females become very male-like in appearance.” I could say that this statement applies to people as well, but I wouldn’t dare elaborate on that point. During my few days in their company, the dominant Whiteface activity was courtship. The males (as least they looked like males!) were continually chasing off rivals. One especially feisty individual chose the tip of our fishing pole as his lofty observation post (see beginning picture). He did his best to clear the immediate vicinity of the boat for the approach of a ripe and willing female. Unfortunately, one of those rival males snagged one of those lusty females just before it entered the fishing-pole-male’s domain. There, just out of view behind the boat, he romanced that female and went merrily on his way. 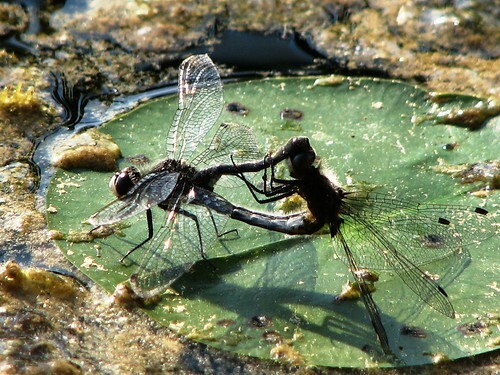 The mating process differs slightly between dragonflies, but in the case of the Whitefaces it was relatively short. The male grabs the back of the females head with a pair of clasping organs located at the end of his body (see below). The female, suspended by the males grasp, turns her abdomen up and reaches into the male’s sperm pouch to transfer the fertilizing agent to her own body. This formation, known as the wheel formation, is unique to dragon and damselflies. The pair can, and often does, fly while so joined. 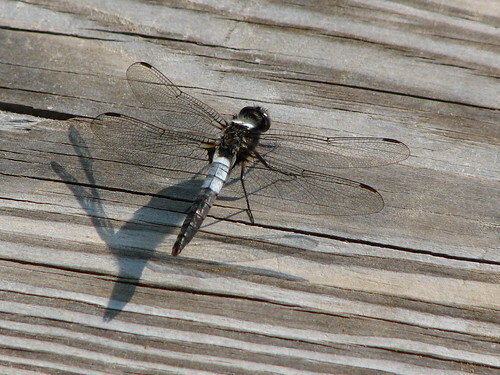 In some dragonflies the male keeps his grip even as the female lays her eggs. Whitefaces apparently don’t linger in this pose. The male broke off the engagement within a few minutes and the female immediately started laying eggs on her own. One by one she dipped the tip of her abdomen into the surface and placed her charges into the weedy waters – insuring another generation of dockside dodgers to carry on the tradition. The Memorial Day weekend at Dollar Lake was very quiet indeed. Thanks to the weedy pond-like nature of this northern Michigan Lake, nary a Jet Ski or motored craft of any kind upset the glassy water. The view from the end of my crooked dock consisted of submerged bladderworts, cattails, and the frantic defensive activities of a pair of Red-winged blackbirds protecting their nest. 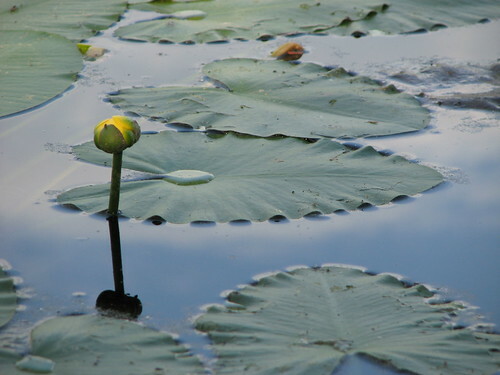 The most obvious visual features of the shallows were the Spatterdock lilies whose ball-like flowers and broad floating leaves covered the surface. There were so many that I was tempted to temporarily name my dock “the spatterdock”, but no one names their dock (besides, “the Dollardock” works just fine). 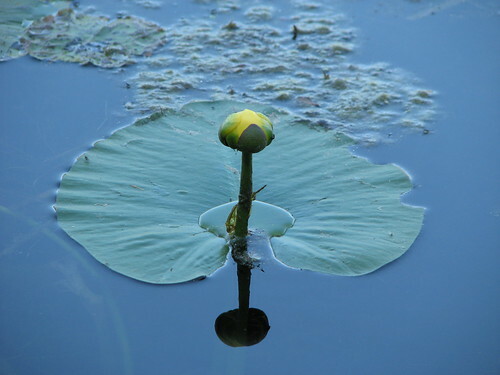 Sometimes called Cow Lilies, these quiet water plants begin blooming in late May and continue into summer. Many of the heart-shaped leaves are already showing signs of seasonal wear with signs of insect damage and evidence of a few muskrat and turtle bites. The fresh leaves, yet unfolding beneath the surface, were still in pristine condition (see here). They would soon suffer the fate of the older leaves as summer progressed. We have reached that time of the season when the crispness of spring yields to the worn look of summer. 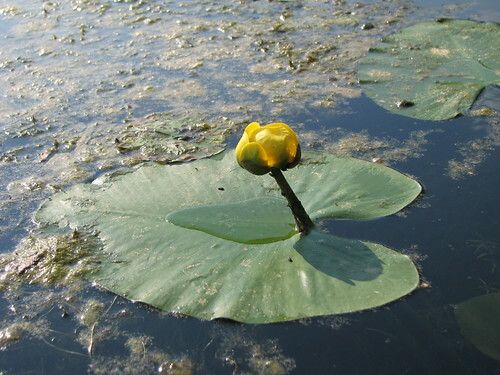 The yellow blooms of the Spatterdock are of the reluctant type. They never appear to get past the bud stage – opening only slightly at the center to allow pollinators (see here). The outer “petals” are actually sepals (a distinction that matters only to a select group of botanists). An inner ring of small petals and stamens circle a large central flat-topped pistil. Since the inner sepals are tinted red (see this view) these Dollar Lake ‘docks were probably a variety known as Bullhead lilies. On the first day of opening, if you can call it that, the bloom exudes a slightly sweet smell. This fragrance ferments over the course of the bloom cycle to a sour brandy-like odor which proves irresistible to pollinating flies. Cow lilies are not proud, if stink gets the job done then stink it is. It was impossible to photograph one of these flowers without including a few flies in the shot (see below and here). 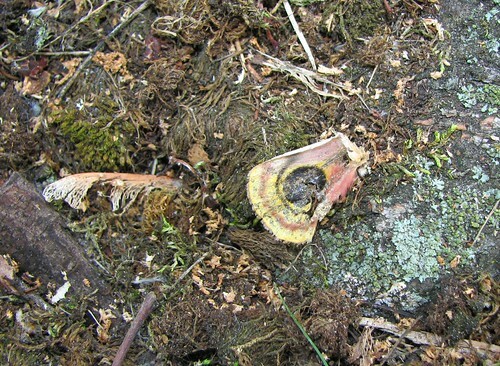 Once pollinated, the petals – er, sepals – deteriorate and fall away to reveal green fluted seed pods (see below). These pods eventually fall apart to distribute their cargo of large ¼ inch seeds. It is said that these seeds can be heated over a fire to a point where they pop “like poor quality popcorn.” Given my experience with Jiffy Pop over the years, I’d have to equate Spatterdock with this “magic treat” (in other words I have never successfully popped a good batch of Jiffy Pop). For those of you who don’t know what I’m talking about, be thankful for microwave popcorn. 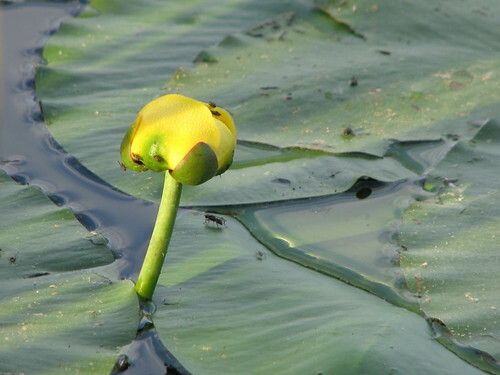 At every angle of the sun, the intense yellow Spatterdock flowers offered some great artistic views. From the dim light of early morning to the harsh light of mid-day and back into the crepuscular time of evening, I was lured into taking way too many shots of these incredible aquatic plants. The other near-shore plants were very much in evidence as well, although I ignored them photographically. The bladderworts were sending up lightly attired stalks adorned with pea-like yellow flowers. Their blooms were showy, but they paled when in the company of the massive spatterdocks. There are two kinds of cattails at dock’s edge, the Broad-leaf and Narrow-leaf variety, and they both were growing at a tremendous rate. I sliced off the exposed portions of a few of the Broad-leaf fronds that were poking up through the slats when I arrived. These leaves were cut flush to the level of the dock surface. Three days later I found that the plants had grown an additional 10.25 inches above the surface – adding over 3 inches a day to their height! On Dollar Lake one could almost set up a lawn chair and watch the cat-tails grow (almost). I did set up a lawn chair to watch the Spatterdocks. Most of the Narrow leaf cattails were entering their flowering stage. Their male flower stalks were pushing up through the furled central leaves of the stem and starting to shed pollen. 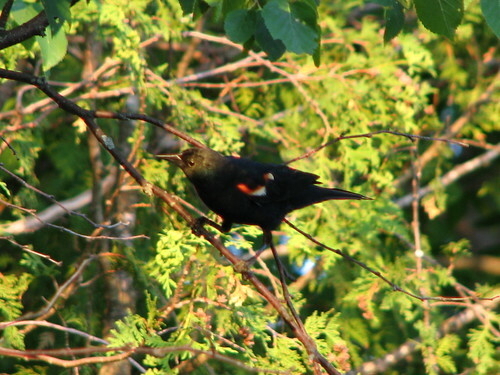 At one point, the male red-wing blackbird landed forcefully on one of the pollen rich stalks and caused it to explode into a cloud of bright yellow dust. The golden wand slapped the bird on the side of the head and coated him with a layer of pollen. You could say that he was spattered by the dock! For the next hour or so, this deep black bird sported a yellow bronzed head (see below). It appears that yellow was the festive weekend color on Dollar Lake.